1 Cut watermelon into large wedges and remove peel. 2 Cut melon wedges into pieces. 3 Rinse thyme and shake dry. Strip leaves from 2 sprigs and puree with melon and broth in a blender. Season with salt and pepper. 4 Rinse scallions, shake dry and cut diagonally into rings. Cook in a dry, non-stick pan briefly. 5 Add the apple juice, bring to a boil and then let cool slightly. 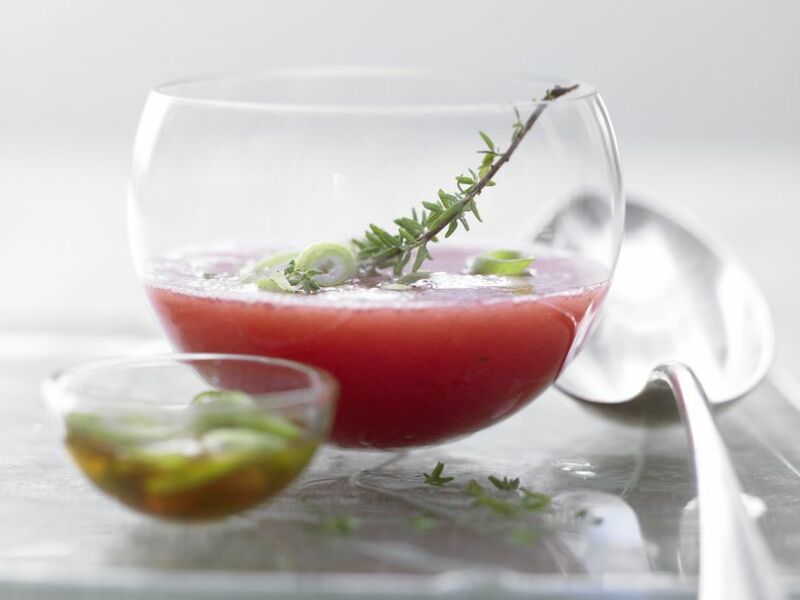 6 Divide the melon puree among glasses, top with scallions, garnish with remaining thyme and serve.